Q: What grass does the Brill Accu work on? A: Works well on all grass types, including St. Augustine. Not recommended for Bermuda and Zoysia grasses. The deciding factor is usually your lawn size. 2,500 sq feet or less is what we recommend. Here is help figuring out your lawn size. Q: What is the difference between an electric rotary mower and an electric push reel mower? 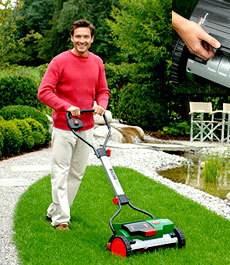 The Accu electric lawn mower is also a push mower so you can easily mow when you run low on battery. Or even without the battery at all. We do recommend the battery for those tougher turf types such as St. Augustine. The Accu electric lawnmower is by far the quietest and lightest of all cordless electric mowers. It even weighs less than most push mowers. Many people equate noise and weight with a "good mower"...the Brill Accu proves this wrong! Q: Why is the Accu the only mower with long lasting sharp blades? The Accu reel blades are unique. The reel blades miss the bedknife by .05mm, which is why the blades cut better and rarely need sharpening. On most other models the reel blades make contact with the bedknife which explains why other push reel mowers need frequent sharpening. And of course all rotary blades need to sharpened regularly. In short, lifetime precision cutting with no hassle, sharpening cost, or repair shop time! Based on the 250mAh output capacity of the charger, that means it will take 12 hours for the 3.0Ah NiMh cells. 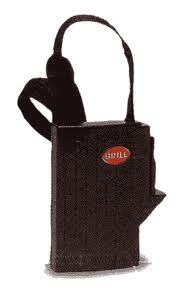 One Recell Option: We offer one recell option for the 24V Brill packs. Nickel-metal hydride (NiMh) cells or 3.0Ah NiMh cells. One Service: Additionally, since we recell the packs using NiMh cells they are more environmentally friendly to manufacture and do not suffer from charge memory effects that NiCd typically do. The Cells: The cells we use are made to our specifications to be high-drain cells, meaning they are designed to take high loads for a sustained period of time (ours can take a sustained 10X cell capacity load). Basically this means the cells were made for a high-drain use in mind (ie. power tools or in your case lawn mowers which need peak torque output). Best Practices: Charging time will vary depending on how depleted the battery pack is when you start to charge. The Brill charger is a simple transformer with a stated voltage output of 24V DC at 250 milliamperes (mA) current. A 3000mAh battery would take roughly 12 hours with similar conditions. Leaving the battery pack connected to the charger for a longer period of time won't necessarily damage the pack if it is under 36-48 hours but they shouldn't be left connected indefinitely either. The battery does not need to be fully depleted before charging but do keep in mind the charge time will be shorter and therefore should be connected to the charger for a shorter period of time. That being said it is a good idea to fully discharge then charge the battery pack 3-4 times when first purchased. This will help achieve a full capacity for the pack. Nickel Metal Hydride (NiMh) battery packs do not suffer from "memory" effect like NiCd batteries do. Charging a NiMh pack at various stages of discharge will have no long term effect on the packs overall capacity. NiMh battery packs, similar to NiCd, are rated for 500-600 full discharge/charge cycles over their lifetime. In reality the number of cycles is longer since most packs are not fully discharged before being charged again. NiMh packs have a somewhat higher self-discharge rate than NiCd. Therefore it is good practice to charge an idle pack every two months or so. Storing the pack in a cold environment will help slow their discharge too.